Andrea Benini (born March 14, 1977), also known as Mop Mop is a musician, music producer and composer from , Cesena, Italy. He has worked in jazz, funk and club music. Benini began playing guitar at age 10 and he started playing drums at age 14. At the end of 1999, Benini moved to Bologna and he attended the “Discipline dell Arti, della Musica e dell Spettacolo” (DAMS), pursuing the study of African-American music and Contemporary music. From 2000 to 2003 Benini worked as journalist for the Italian magazine “Percussioni” interviewing musicians like Joey Baron, John Riley, Terry Clarke just to name a few. As of 2005, his current project is Mop Mop, a funk/afro/jazz mix including musicians Alex Trebo on piano, Pasquale Mirra on vibraphone, Guglielmo Pagnozzi on sax, Bruno Briscik on bass and Danilo Mineo on percussions. Mop Mop debut album “The 11th Pill” was released by Tam Tam Studio in 2005 and later re-released by P-Vine Records for the Japanese market. The first single ”Perfect Day Feat. 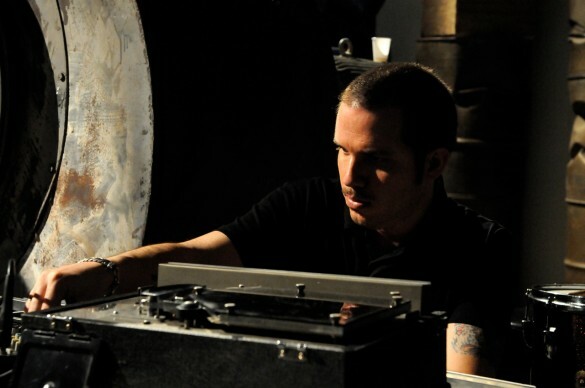 Jackson Sloan” was released by Dejavu Records in 2006 with a remix of Schema Records artist Gerardo Frisina. In 2007 “Perfect Day” was selected by Adrian Gibson for “Messin Around 5”, the London Jazz Cafe compilation featuring artists like Nostalgia 77, Mark Murphy, Sleepwalker, Soul Jazz Orchestra just to name a few. In 2008 Benini has produced Mop Mop’s second album entitled “Kiss oF Kali”, released by the German label Infracom Records in 2009. The album features Down Beat Critics Poll winner Gianluca Petrella on trombone and Alan Farrington on vocals. Infracom Records released Mop Mop’s third album “Ritual Of The Savage” in 2010. The album includes the UK’s singer Baby Sol ( backing vocaling for the likes of Amy Winehouse, Joss Stone, Nate James ). In 2012 Mop Mop achieve the international film business as part of Woody Allen‘s “To Rome With Love” soundtrack with the song ” Three Times Bossa “, composed by Andrea Benini/Alex Trebo and produced by Tam Tam Studio. Mop Mop music is released by labels like Sony/BMG, Universal, Wagram, Agogo, Infracom, Freestyle, P-Vine and supported by DJs like Gilles Peterson, Toshio Matsuura, Michael Ruetten, Pete Isaac, Simon Harrison just to name a few. During the last years he has performed in Italy, Germany, France, Poland, Hungary, Spain, Turky, United Kingdom, United States, Russian Federation, appearing in clubs, jazz clubs, theatres, festivals, national radio and television. Benini is actually living and producing his new works in Berlin. His fourth studio album “Isle Of Magic” which includes funk legend Fred Wesley on trombone and British poet Anthony Joseph on vocals, is to be released in 2013.